I am a huge Coen brothers fan. Most people don't really get their movies, and they have had their misses (The Ladykillers to name one) but all in all the Coens are adventurous, and masterful storytellers, so when I saw the trailer for their newest film "No Country For Old Men" I was instantly intrigued. The trailers never reveal too much, but most have come to expect that from a Coen movie. I mainly wanted to see it because it was the Coens, Josh Brolin is quickly becoming one of my favorite actors, and Javier Bodem had a funny haircut. What I got from No Country was not what I was expecting. I know the Coens have taken on the crime movie before with the amazing Fargo, but here they stepped it up. Everybody in the cast gave phenomenal performances, and the haircut was the only thing funny about Javier Bodem. I suppose I'll start with that. Bodem's brooding emotionless hitman left a scar on me. I just recently had a nightmare involving him because his performance is that good. He is evil incarnate and plays it so beautifully with his towering frame and deep voice you almost forget he's just a movie character. This film would have suffered in the hands of any other director, but the Coens have proved one thing over their career. They are good at telling stories. This is no different in No Country, they fit an entire book into a two hour time slot lifting most of their dialog and key events straight from the novel. Another thing Joel and Ethan have shown through their gruesome crime movies is that man is capable of unspeakable things, but what they have shown in their films has been gruesome, but real. None of what they have presented is something I would have trouble understanding and that is truly terrifying. The coens are not afraid to show the darker side of human nature for what it is, disgusting. Not to say that they glorify it by any means, they are just unflinching with their detail to events. 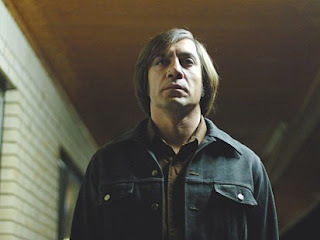 No Country For Old Men has been turning heads for award season for good reason. People connect with it. It's a story, it's plausible, and it seems as if it has been lifted directly out of somebody's worst vision of Hell. No Country is incredibly layered and may require several viewings (especially to understand the speech just before the abrupt ending) and is quite disquieting, but one thing is for sure, No Country is some movie.